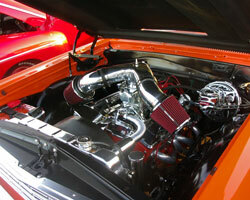 In a world dominated by 14” round air cleaner assemblies, Greg Hacker of Rancho Cucamonga, California, decided to make his 1964 Chevrolet Malibu SS stand out from the crowd by using the Spectre dual plenum air intake assembly, part number 761, and dual Spectre air filters, number 8132. 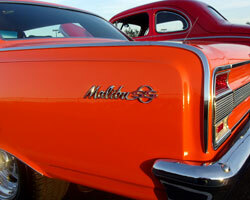 The Malibu was originally a top-of-the-line subseries of the Chevrolet Chevelle before the Malibu became its own nameplate much later in production history. 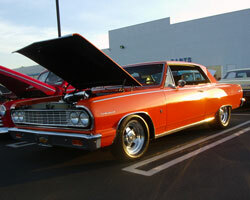 Greg Hacker has a long relationship with the first generation Malibu SS from Chevrolet. “The ’64 Malibu SS was the first car I ever wanted” said Hacker, “and I had my eye on this car when my neighbor brought it home”. Greg’s neighbor bought this car, in rather rough shape, with the intent to restore it. As time went by, and circumstances changed, Greg’s neighbor realized he didn’t have the time a frame-off restoration would require. Having put a bug in his neighbor’s ear, Hacker was first in line when the 1964 Malibu SS went up for sale. Greg Hacker, being a painting contractor, arranged to paint his neighbor’s house in exchange for the car. With the shake of a hand, and a freshly painted house, Greg finally acquired his dream car. As a contractor, Greg is a pretty handy guy. He was able to complete nearly every part of the restoration himself, including the bright orange paint. When asked what help he received, Greg said “I didn’t reupholster the seats, and the engine came from my brother who owns Hacker’s Hot Rods in Las Vegas, Nevada.” Greg estimates the 350 cubic inch Chevy Small Block engine to produce about 400 horsepower. To allow for more customization options, air intake system number 761, does not include air filters. This allows the end user to choose the air filters, or additional tubing that will work best for their particular configuration. 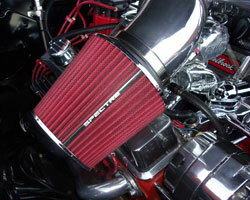 When it came to air filters, Greg chose two of Spectre air filter 8132. Using the included adapter rings, 8132 can fit 3 inch, 3-1/2 inch, and 4 inch diameter tubes. Manufactured using high quality materials throughout, including oiled synthetic media, urethane, and steel mesh, this washable performance filter is engineered for low restriction and better performance. 8132 uses an inverted cone filter top for improved service life and enhanced flow potential. Designed with a triple chrome plated steel top and base, this 5-1/2 inch tall air filter is factory pre-oiled and ready to use. While Greg Hacker had to spend a lot of time, and put in tons of work to get this beautiful car looking the way it does now, his air intake system choice was easy. According to Greg “I walked into my local auto parts store and found the intake system sitting on the shelf.” Hacker liked the dual plenum look and was immediately sold on Spectre Performance part number 761. To find your nearest Spectre Performance retailer, use our dealer search, located here. Browse all Spectre automotive products by category at SpectrePerformance.com. While you are there use the Products by Vehicle Search to find Spectre performance products specifically made for your vehicle.